The Iridis Wrasse is also known as the Radiant Wrass, Orangehead Wrasse and the Radiant Africa Wrasse. It is found in the Western Indian Ocean. Males and females are both 4.7 in. This wrasse has a peaceful nature and should only be housed with peaceful fish. Minimum tank size is 40 gal. The aquarium should have a sandy bottom for the fish to hide in. Feed live meaty foods. 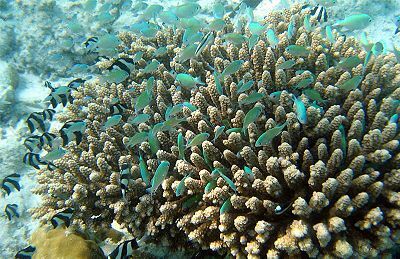 It will not harm corals, but may eat snails and ornamental shrimp. The Iridis Wrasse is known for jumping out of tanks, so a tight-fitting lid is crucial.